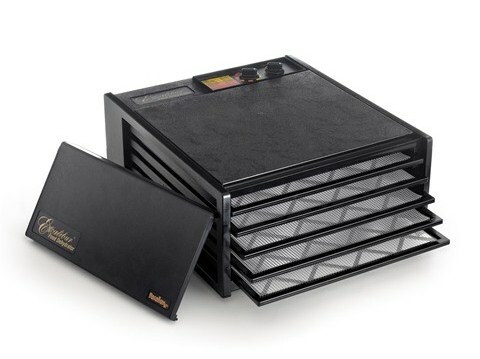 I never thought I needed a dehydrator. I mean, I can buy prunes ... um, I mean dried plums, at the grocery store. Dehydrators are large. They're not something you'd keep on your counter all the time, and unless you have huge cabinets, storage might not be convenient. So why are they so popular? I know a lot of people who have dehydrators. Some of them don't have food processors. My first foray into doing any sort of food dehydrating was with the stove I got a few years back that has a dehydrating setting. That's just fine except it ties up the oven for a looooong time. And my oven wants to do other things. So when I got the Excalibur 5-tray dehydrator ($250), i was more than happy to clear a little counter space to free up my oven while I was busy drying fruit and vegetables. This isn't an appliance that you'd keep on the counter long-term - unless of course you have tons of counter space - but when you're in the midst of drying season, I can imagine it would stay parked for quite a long time. Unlike my oven, this is designed for drying, with 5 trays in a reasonably compact space. So I can dry more product in this than I could in my oven with its three racks. And it does a mighty fine job. The instructions suggest turning the racks for even drying and removing the pieces that might be done sooner. But I've got to say it dried foods more evenly than my oven, as well. Not perfect, but better. The unit I received has a timer, which is great if you can't be around to turn it off. I don't think I'd want a unit without this feature. If you want to park your dehydrator on the counter and get more use from it, you can use it for proofing dough, re-crisping crackers, drying pasta, or incubating yogurt - pretty much anything that needs a reasonably stable temperature. The thermostat range is from 85 to 155 degrees. So far, the only problems I've had with this unit have been user error. The first few times, I got a little carried away with the drying and ended up with crisp rather than still-moist dried fruit. But that's okay. I figured it out, and subsequent batches were a heck of a lot better. It's also important to cut pieces into even thicknesses - but that's true with any dehydrator. Not everyone's going to need a food dehydrator, obviously, but if you're in a market for one, this unit's got a lot going for it. This was provided to me by the manufacturer for review on Serious Eats.